To get you started on the right foot I am posting some of my favorite healthy and family friendly meals and snacks. I am trying out a few different formats to see what you guys prefer. so please leave me feedback on what style you like best for recipe posts. This one is my families favorite dinner. My husband always requests a double batch so that he can take leftovers to work for lunch. *Greek yogurt replaces sour cream in this classic dish, and the addition of bell peppers provides vegetables, making it a nutrition all-in-one meal. Heat a large skillet over high heat and add 2 tsp of the oil. 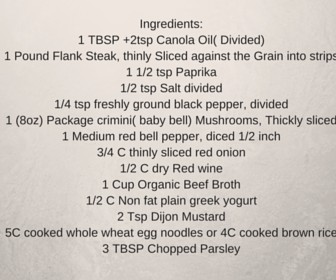 Add beef in a single layer and sprinkle with paprika, 1/4 tsp of salt, and 1/8 tsp of pepper. Brown for 4 minutes and add 2 Tbsp of water at the end, using a wooden spoon to scrape any brown bits from the Bottom of the pan. Transfer beef to a plate. Place pan back on medium heat and add remaining Tbsp of its. when oil begins to shimmer, add mushrooms, bell pepper, and onion and sauté until tender, about 7 min, reducing the heat as vegetables shrink. add wine and simmer until mostly evaporated, about 2 minutes. add broth and reduce by half. add cooked meat back to the pan to reheat. remove the pan from the heat for 1 minute and stir in yogurt and mustard ( removing the pan from the heat prevents the yogurt from curdling.). 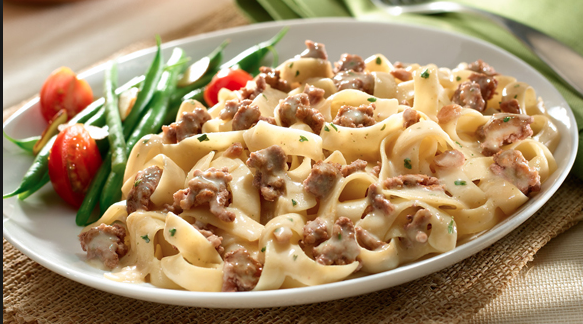 Serve the stroganoff over the cooked noodles, sprinkle with parsley and enjoy Hot. Per Serving: 374 Calories: 9 G Total Fat; 2G Saturated Fat; 28G Protein;37G Carbohydrate; 6 Dietary Fiber; 50 MG Cholesterol.